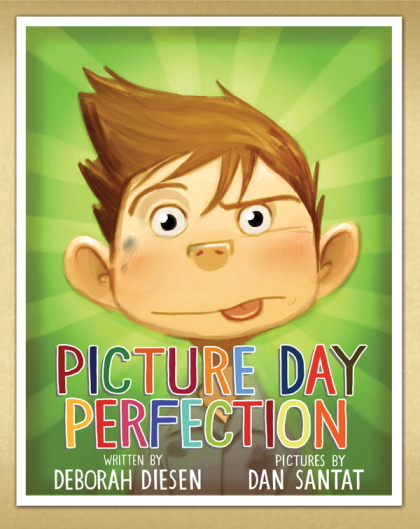 Our BLG book this week was Picture Day Perfection written by Deborah Diesen and illustrated by Dan Santat. This funny book was read to us by Peter, a BLG reader new to our classroom. Welcome Peter! This book is quite a clever story with an interesting ending that surprised us all in a wonderful way. The boy in this story has been planning for Picture Day for months and months. It seems like everything that could possibly go wrong in his day, does. There is “sticky uppy” hair, breakfast that doesn’t stay on the plate, a favourite shirt that was unearthed from the bottom of the laundry basket. The day progresses to trouble on the bus, nausea from all the people saying “cheese” and art class mess. When it is finally time to have his picture taken, we discover that picture day perfection can mean many different things for different people. And a happy smile was perhaps not part of the plan . . . (except for Moms). Spend time exploring the book jacket and end pages – many hilarious picture day snaps and even a frame to include your own photograph. Steven rated this book 5/5 and writes: At breakfast, he made a mess. He was dripping syrup. The picture was funny. When he smiled he has a missing tooth. I like the face. Shereese rated this book 5/5 and writes: I loved the book. It was a funny picture when he wore a stinky shirt for picture day. His Mom picked a grey background that he did not like. Sara rated this book 5/5 and writes: He is funny because he made a mess in his hair. It Iooks like his face is like the Grinch. He planned for next year. Arianne rated this book 5/5 and writes: I thought it was weird – he wanted a bad picture day. He had syrup on his face. He wanted a funny picture. Hyo Min rated this book 5/5 and writes: My favourite part was when he made a funny face. I love the part when he got caught from the click. Why did he made funny faces? The illustrator made pretty pictures. I liked the pictures because it’s all wonderful, like the faces makes me laugh. Vicky rated this book 5/5 and writes: I love the part when he spit spitballs on the driver because it was gross and also funny. I think the photographer was tricking the boy to make him so he can make him smile. To the author: Why did the boy not have a name? Ibtihal rated this book 100/5 🙂 and writes: It was sunny when he made faces. Why he didn’t paint on his shirt? Why did he pore syrup on his self? He looked sleepy. Why does he hate picture day? I have a connection – when it’s picture day, I have a bad hair day. Kelvin rated this book 5/5 and writes: What is the boy’s name? Why is the boy making silly faces? Why is the boy always goofy in picture day? I liked how the boy spit balls at the driver. I liked how the illustrator made every picture bright. If the colour was black and white, it will be boring. With colour, it will be beautiful. Gracie rated this book 4/5 and writes: I liked when the boy who has no name made goofy faces. It was surprising when his idea of a good picture day was a goofy face. Note to author: Why do you not tell us his name? My favourite part is when he was mad because his mom chose the same boring grey background. I liked this book. It was funny. Jerry rated this book 5/5 and writes: I liked when the boy try to choose a face. When it was picture day, he had to eat breakfast. At the bus he shoots spitballs at the driver. In school the teacher ask the boy have you choose a colour yet? The boy thought his Mom pick grey colour. When it’s picture time, the boy hates cheese. Then it’s his turn for picture time and he doesn’t like cheese so he chooses a funny face. Then his Mom sees him in the picture. He has a missing tooth but not his brother. This entry was posted in BLG Reads this week and tagged BLG Reads, Dan Santat, Deborah Diesen, favourite illustrators, fiction, great read alouds, humour, picture books by carriegelson. Bookmark the permalink. Hi Everyone! I’m glad you shared about this book because everyone at my school is always very nervous about picture day too. They want to look great, but sometimes it doesn’t work out so well. I think the kids at my school will love this like you do! I also like all the questions you are asking in your comments. To me that means it’s a good book to talk about! Have a good week! Your reviews are so nicely written!!! Can I please borrow this book!?!?!? It sounds great! Absolutely! A lot of fun and quite the surprising ending!